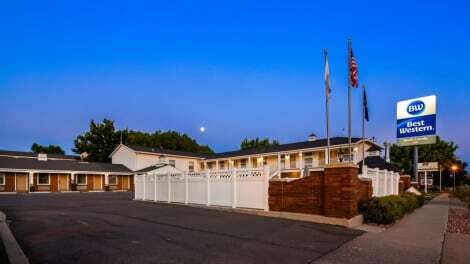 Located in Beaver, Best Western Paradise Inn is in a rural location, within a 5-minute drive of Beaver Court House Museum and Beaver City Hall. This hotel is 9.5 mi (15.2 km) from Fishlake National Forest and 1.7 mi (2.7 km) from Main Street Park. Make yourself at home in one of the 34 air-conditioned rooms featuring refrigerators and LED televisions. Complimentary wireless Internet access keeps you connected, and cable programming is available for your entertainment. Private bathrooms with shower/tub combinations feature rainfall showerheads and complimentary toiletries. Conveniences include desks and microwaves, as well as phones with free local calls. Make yourself at home in one of the 35 air-conditioned rooms featuring refrigerators and LCD televisions. Complimentary wireless Internet access keeps you connected, and cable programming is available for your entertainment. Bathrooms have shower/tub combinations and hair dryers. Conveniences include microwaves and coffee/tea makers, and you can also request cribs/infant beds (surcharge).